The Light Dome Mini II has a shallower design than the larger Light Dome,making it the ideal choice for creatives needing soft light in a more confined space,such as an office,small studio,or room. 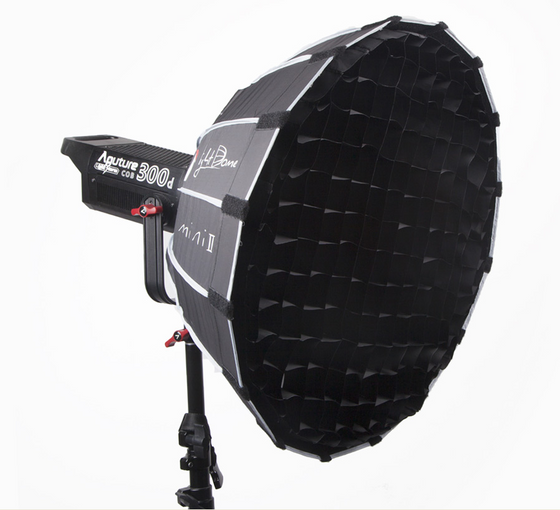 The new versions of the Light Domes feature a new generation of the quick-release speed ring.You can now easily install and disassemble the dome in less than 1 minute.This new generation addresses the needs of creatives who are on fast-moving sets and need a diffusion solution that can be rapidly set up. Featuring¼grid cloth and gold+silver reflective inner baffle options,the Light Dome Mini II offers multiple options for diffusing your light source,allowing you to have more creative choices.High quality fabrics allow you to retain your light original color temperature. The Light Dome mini II comes with a specially designed gel holder to allow filmmakers to maximize their creativity while minimizing fabric use. *Caution:When using color gels with powerful LED lights,such as the Aputure C300D,the heat will cause the filter gels to distort or burnt after a period of time.You are advised to change new sheets of color filters once every three hours during constant usage;You are recommended to use ROSCO or LEE for better results. The Light Dome Mini II includes an fabric eggcrate-style grid to help fine tune your cinematography and control your spread of light to 40 degrees. The new Light Dome II is designed to fit with all fixtures from the Light Storm COB family.It is also compatible with a wide variety of Bowens mount lighting systems,the most common mounts used in the world of photography. 16 rods create two points of contact for 32 sides of an ultra round shape,giving your subject a flattering specular highlight in their eyes.